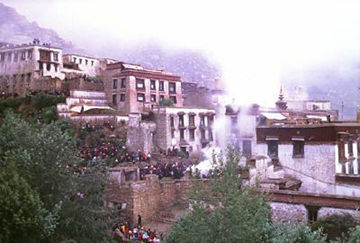 Drepung Loseling Monastery was one of Tibet's largest monastic universities. Located in the hills on the northern outskirts of Lhasa, it was established in 1416 as an institute of higher Buddhist education by Khenpo Lekden, a direct disciple of Lama Tsongkhapa (1357-1419), founder of the eclectic Geluk School. The First Dalai Lama was also a disciple of Lama Tsongkhapa, and the Second Dalai Lama built a residence in Drepung, called the Ganden Potrang, which remained a hereditary seat of all subsequent Dalai Lamas. At its zenith Drepung Loseling housed some ten thousand monk students. These were drawn not only from Tibet, but also from China, Himalayan India, Mongolia, and the Mongol regions of Eastern Russia.